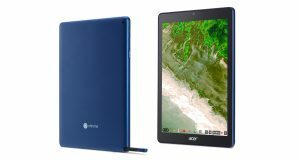 The brand new Acer Chromebook Tab 10 has now been released and will be ready for pre-order shortly. This is the first Chromebook OS tablet for business that offers a mobile, lightweight touch device on the same Chrome OS platform you know and love for management and shareability. The Acer Chromebook Tab 10 comes with a fantastic 9.7” QXGA IPS display with 264 PPI, this enhances every image with dazzling colours and brings out all of the amazing details, thanks to 35% more pixels per inch than Full HD panel. Lightweight and super portable, the tablet is the right size for office or mobile working. Flexible and mobile working is increasingly easier with the tablet offering up to 10 hours of battery life, which is perfect for all-day use. The integrated Wacom EMR stylus pen allows for a natural drawing and writing experience, plus it does not need a battery and is tough enough to survive accidental drops. The Acer Chromebook Tab 10 can be shared throughout the workplace since Chrome OS supports multiple user sign-in, giving employees access to their information, apps, projects, Gmail, and office 365 and more when they log onto their unique account. Even if a device is lost, stolen or damaged, employees won’t lose their information. Storage on Google Drive or other cloud storage, keeps files documents and photos stored safely in the cloud, and ensures that the most current version is always up to date and available. Plus, Chrome OS is automatically updated and guards employees against ever-changing online threats, such as viruses or malware. Acer Chromebook Tab 10 has all of the advantages of Chrome OS, including fast startup, ease of use and built-in protection from viruses and malware. Plus, the operating system is always current thanks to the automatic updates. Support for Chrome Enterprise Licence allows central and remote management of a large number of tablets. It enables IT administrators to add users, create groups, enable employee tablets to receive content, monitor network access or manage access to apps. Powered by a low power, high-performance OP1 processor paired with 4GB of LPDDR3 memory, Acer Chromebook Tab 10 is fitted out with 32GB of storage, which can be expanded via micro SD card. The USB 3.1 Type-C Gen 1 port allows ultra-fast transfer of data, high-resolution multi-display output and quick charging of devices, including the Acer Chromebook Tab 10. The tablet also offers access to G Suite, a set of productivity tools designed to enable employees to communicate, collaborate and share. In addition, the Acer Chromebook Tab 10 fully supports Google Play, which gives admins and employees access to Android apps that have been approved and curated by administrators to let them collaborate, discover and engage. Find out more about other Chrome products here.